If you haven't installed NppExec PlugIn, follow this tutorial, http://setup-steps.blogspot.com/2013/05/notepad-adds-plug-in-nppexec.html, before proceeding to the next step. 1. Disable "Console Command History"
2. Enable "Save all files on execute"
3.4. Click Save. Type the name as "Compile". 6) Add the Execute Command Names as menu. 6.2) enable "Place to the Macros submenu". “Compile and Run” in the “Item name:” box before hitting the Add/Modify button. 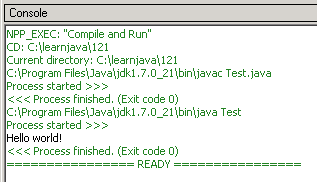 8) Test by creating Test.Java file. It could be caused by Windows not knowing the path to javac program (possibly true when you are using Notepad++ Portable Version, because it is running in its own memory container).